I didn't knit much this week. I wrote the Finishing with Confidence article and the patterns for the Confident Beginner series. I also wrote the blog entry for my TKGA blog on the design process. I also got a head start on my spring cleaning...wishful thinking I suppose as it has been quite cold here. I did manage to get my four seasons to the post office. I am loaning them to RedFish to display at Stitches West. I received an email from a Basics student who is having trouble with the duplicate stitch method for weaving in yarn tails. I've done several videos and blog entries about this but one thing I have learned is that everyone learns in different ways so here we go again. When you use this method to weave in yarn tails you duplicate the stitches on the WS of the work by following the path of the stitches. I've noticed that some knitters see this immediately while others really struggle. One suggestion I have made in the past is to knit a swatch with very large needles. Work several rows in one color and then a row in a different color. Here is a photograph of a swatch I did several years ago. It also has a section near the top where there is a mid-row color change (something you do in Level 1 of the Masters Program). It is much easier to see the path of the yarn in the single row in a different color. 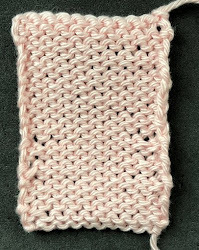 I then suggest to those having difficulty with this that they practice the duplicate stitch on this single row. Since the stitches are larger it is easier to see. When you have it down, you can then try it on swatches knit with smaller needles. Salon will be on Saturday from 1:30 to 3:20. As I said, I didn't do much this week. I did finish the socks I started last week. A couple of years ago I started a sweater to replace a machine knit one I love. I've finished the back and fronts but then put it away. I picked it up again to start the sleeves. Since the yarn is a lace weight and I am using 00 needles it will take some time. I got out the RedFish yarn I am going to use for a sweater in the next issue of Cast On. I'm using the chart I did for the Thalassa socks. The name of the sweater will be Wine Dark Sea. This is a phrase used in the Iliad and Odyssey to describe the Mediterranean Sea. When I saw these colors at Redfish's booth at our meeting in Manchester, I was reminded of the phrase. I hope to start it soon.